Concurrent Resolution No. 22, designating the eastern goldfinch (Spinus tristis tristia) the official state bird of Iowa, was approved by the Iowa House of Representatives on May 21 and the Iowa Senate on March 22, 1933. Be it Resolved by the House of Representatives, the Senate concurring, that the Eastern Goldfinch, Spinus tristis tristia, is hereby designated and shall hereafter be officially known as the state bird of Iowa." The eastern goldfinch, adopted by the 1933 Iowa Legislature and recorded as Spinus tristis tristia, is now referred to as the American goldfinch and has been classified as Carduelis tristis. The state bird was approved by Concurrent Resolution and is not part of the Iowa Code. 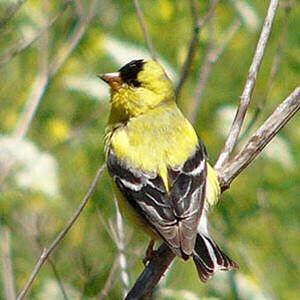 Carduelis tristis (American Goldfinch): University of Michigan Museum of Zoology: Animal Diversity Web.